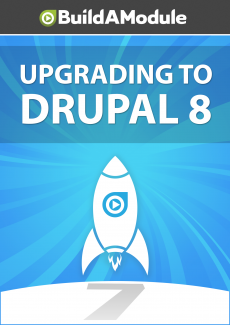 Welcome to "Upgrading to Drupal 8"
If you're trying to figure out if it makes sense to migrate to Drupal 8 or start a new Drupal 8 project, this series will give you a solid foundation in the differences and how to manage the upgrade process. We're going to start by exploring the changes in Drupal's interface, and then we'll follow it up with more developer-centric videos on working through the actual migration process. If you've had some experience with Drupal 7 and are trying to decide if there are enough good reasons to upgrade to Drupal 8 or start a new project in 8, then this series is meant to give you a thorough but streamlined overview of the changes that have taken place and what they mean for your workflow. An amazing amount of work has gone into improving nearly every aspect of Drupal, and as you start the process of learning I can almost guarantee that you'll get more and more excited. As I prepared for this collection I found myself feeling really proud of the Drupal community. Drupal 8 has been in development for years and even though there have been some dramatic changes none of them has occurred without a deep comparison of the pros and cons of each change. From the perspective of someone who has used Drupal for nearly a decade every change I've seen has felt both important and carefully restrained. The things that were working in Drupal 7 were kept around and the things that weren't have been fixed or improved.